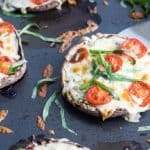 Low-carb has never been more delicious than in these easy Portobello Caprese Pizzas… curb your pizza cravings without the guilt! 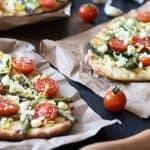 You’ll never miss the crust in these pizzas! They’re just the perfect size for a personal pizza. Serve with a salad for a satisfying complete meal. 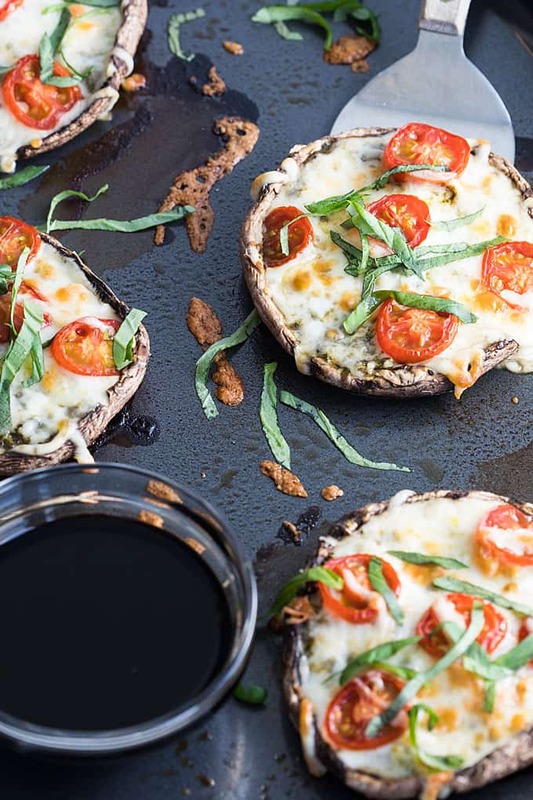 Anyone who knows me well knows that two of my favorite foods are mushrooms and pizza. 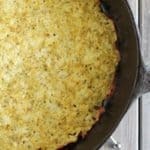 Although I don’t eat low-carb, this is definitely going to be on the menu rotation. I’ve considered the low-carb diet but I just can’t go there… my love for bread, potatoes (and beer ) have conquered for now. But this pizza is so satisfying, I never missed the bread. 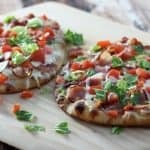 Another great thing about this recipe is that it comes together in under 30 minutes for a quick and easy weeknight dinner. YES! Preheat your oven to 400 degrees F. Spray a rimmed baking sheet with cooking spray. 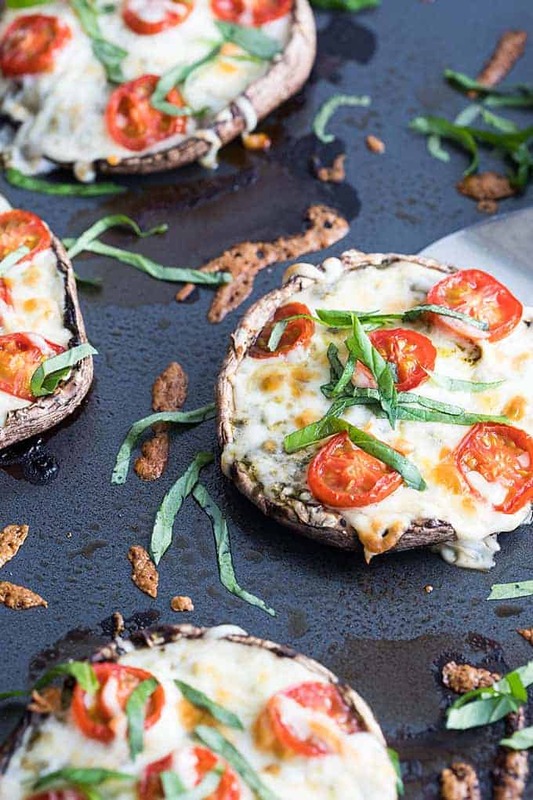 Place mushrooms on baking sheet and spread 1 tablespoon pesto in each mushroom cap. 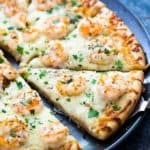 Top evenly with mozzarella, then tomatoes. 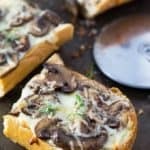 Bake for 13-15 minutes, or until cheese is melted and bubbly. 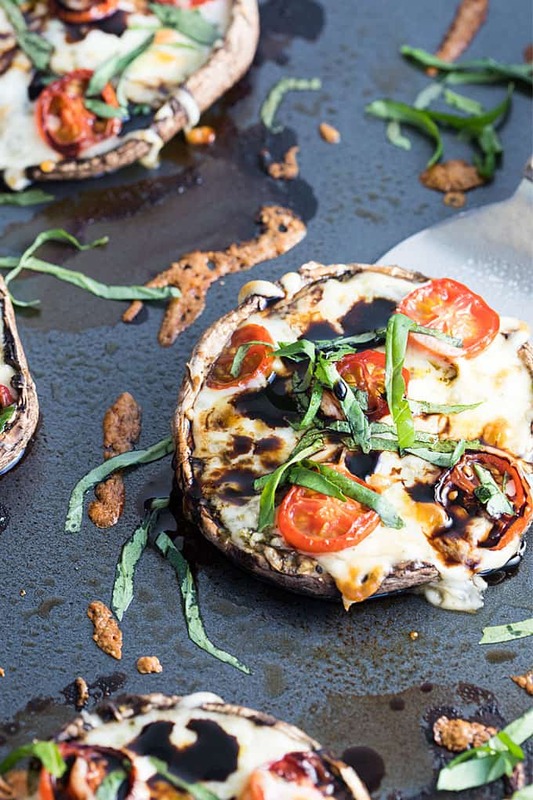 While pizzas are baking, prepare the balsamic reduction. Place balsamic vinegar in a small saucepan over medium-high heat. Bring to a boil and reduce heat to maintain a simmer. Simmer for approximately 8-10 minutes, or until desired consistency is met and reduced by about half. 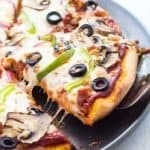 Top pizzas with fresh basil and drizzle with balsamic reduction.